Home / Small Animal Supplies Equipment / Diets - Treats / Hang-N-Hay Donut by Ware Mfg. Hang-N-Hay Donut by Ware Mfg. Hang-N-Hay Donut by Ware Mfg. offers high fiber fun for your furry friends! 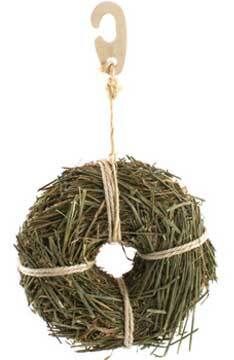 It is 100% natural and chewable,and hangs anywhere in a pet's cage on the natural wood hanger.